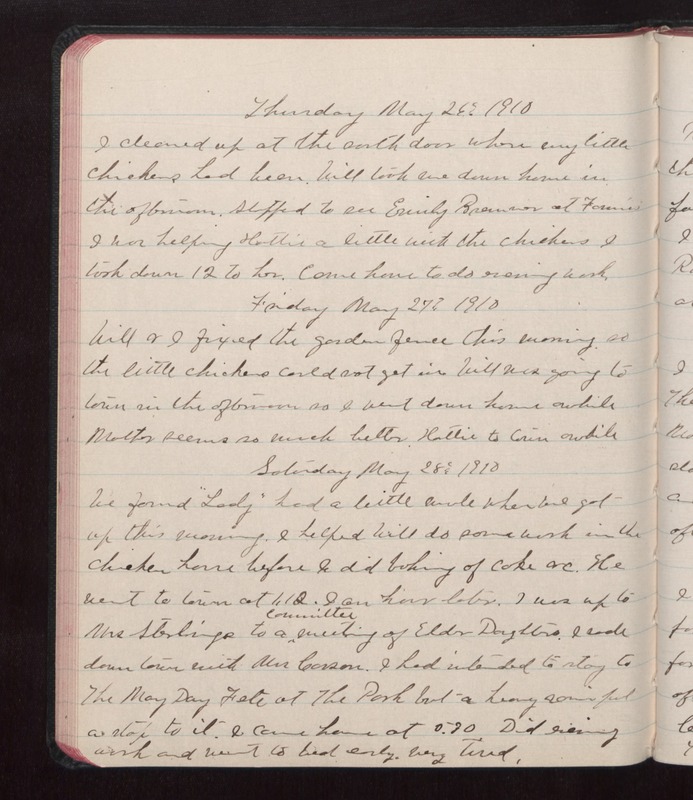 Thursday May 26 1910 I cleaned up at the south door where my little chickens has been. Will took me down home in the afternoon. Stopped to see Emily [Bremer?] at Fannies I was helping Hattie a little with the chickens I took down 12 to her. Came home to do evening work. Friday May 27 1910 Will & I fixed the garden fence this morning so the little chickens could not get in. Will was going to town in the afternoon so I wet down home awhile Mother seems so much better. Hattie to town awhile. Saturday May 28 1910 We found "Lady" had a little mule when we got up this morning. I helped Will do some work in the chicken house before I did baking of cake &c. We went to town at 1.12. I am home later. I was up to Mrs Sterlings to a committee meeting of Elder Daughters. I rode down town with Mrs Carson. I had intended to stay to the May Day Fete at the Park but a heavy rain put a stop to it. I came home at 5.30. Did evening work and went to bed early. Very tired.